At the suggestion of the city of Saint-Denis and the Plaine Commune urban community with the agreement of the Ministry of Culture and Communication, the spire of the basilica, dismantled during the 19th century, will be reassembled as part of a work site that can be visited from spring 2018. Built up at the beginning of the 13th century, the spire of Saint-Denis was considered, at that time, as one of the most spectacular work of the Parisian region. This traditional spire made of Roman rocks completed the construction of the westwork of the abbatial church undertaken a few decades ago by the Suger Abbot. Appearing on every ancient representation of the abbey and the city, it had been spared by the French wars of religion such as the Revolution. 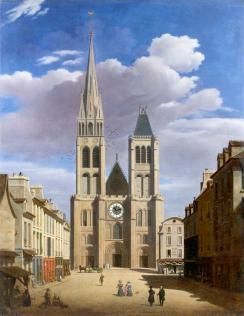 After Napoleon Bonaparte ordered to repair the basilica, it was restored by François Debret in 1837-1838. During spring 1846, weakened by 1842, 1843 and 1845 tornados, the spire had to be carefuly removed to enable the consolidation of the tower carrying it and then to be put back at its place. Yet, this reassembly could not happened because of other priorities. Since 1847, the facade of the basilica is still missing its spire and northern tower. Since the middle of the 19th century, it is striking to notice that every historical work dedicated to Saint-Denis deplore the missing of the northern tower and the spire of the basilica. The idea of the reassembly started to spread step by step and now became a real municipal objective. In 1987, Marcelin Berthelot, mayor of Saint-Denis, officialy launched the project. The reassembly of the Saint-Denis spire had to face for a long time a major problem concerning the money that it would need for such a project. Carried out by traditional firms, this work was estimated at 60 million of french francs in 1992 (about ¤ 9 million). 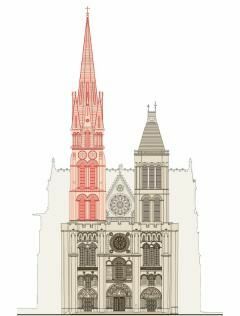 This work will increase the number of visitors at the Basilica of Saint-Denis and might attrack them to the restoration site. This project is part of redevelopment of the historical center of Saint-Denis, realized in 1982 thanks to the creation of the Saint-Denis Archeological Center.